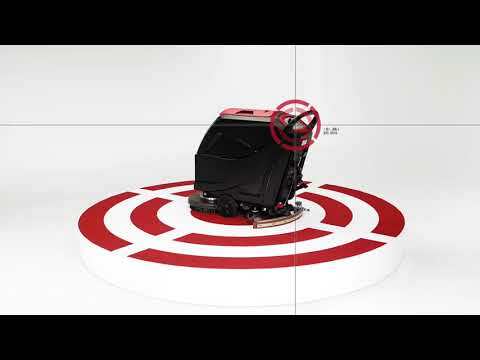 The AS5160T is a highly productive, traction-driven, walk-behind scrubber-dryer with ergonomic design for ultimate comfort. This robust machine is suitable for in-depth performance on indoor surfaces. This product is the ideal choice for cleaning in hotels, restaurants, factories, supermarkets, shopping centres, hospitals, train stations and schools due to its affordability and ease of use. The AS5160T has a working width of 51cm and a powerful 450W brush motor. Combined with the 150W drive motor to give additional traction, the 61-litre capacity water and recovery tanks and the power-packed 2x12V batteries, this model has a high capacity for increased productivity, with hours of non-stop cleaning. The speed reducing gear drive system of this traction version ensures smooth cleaning with minimum effort. This model is easy to manoeuvre due to its big wheels and strong casters and is extremely well-balanced. It comes with a control panel with intuitive buttons and display, along with an hour meter indicator to keep you updated on how long the machine has been running and a water level indicator with volume visible on the tank. It easy to empty, refill and clean this scrubber/dryer yourself, saving time and money. The AS5160T is easy and convenient to operate with 2 pcs safety switches. It is sold with a steady chassis system and rotationally moulded tanks. The heavy duty 79cm aluminium squeegee ensures this model’s reliability. Brush and pad drivers can also be installed and uninstalled automatically. Supplied with a brush, pad holder, 2x12V batteries and onboard charger. Optional skirt kit prevents the machine from splashing water.